Sadiq Khan has repeatedly challenged Donald Trump's calls to ban Muslims or people from majority-Muslim countries from entering the United States, saying the president has an "ignorant view of Islam." Among Donald Trump's tweets on London attack, two were directed at Sadiq Khan. 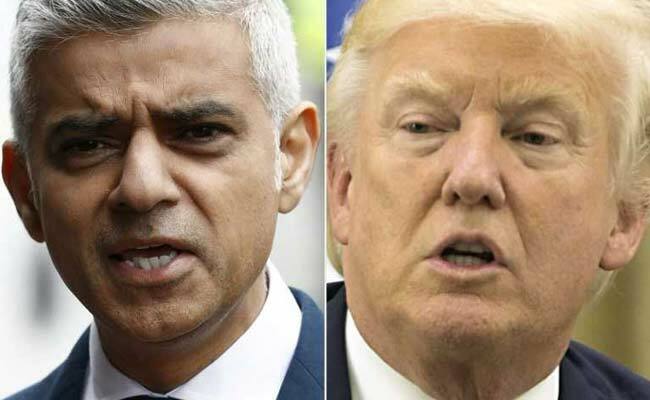 President Donald Trump has reignited a year-long public battle with London Mayor Sadiq Khan, one of the most prominent Muslim politicians in Western Europe, drawing criticism for reviving the feud in the wake of a terrorist attack. In the two days since a group of terrorists killed seven people and injured many others on the London Bridge Saturday night, Trump has tweeted several times about the attack and used it to promote his travel ban, which is being blocked by the courts. Among the president's barrage of tweets have been two pointed messages directed at Khan. "At least 7 dead and 48 wounded in terrorist attack and Mayor of London says there is 'no reason to be alarmed! ', " Trump tweeted Sunday morning, misrepresenting a comment the mayor made over the weekend when he told the city's residents to not be alarmed by an increased police presence in the coming days. Trump was criticized for the tweet but Monday morning he dived right back into the controversy: "Pathetic excuse by London Mayor Sadiq Khan who had to think fast on his 'no reason to be alarmed' statement. MSM is working hard to sell it!" Although Khan has responded to past attacks from the president, he has refrained from doing so this week, with his office saying on Sunday that the mayor "has more important things to do than respond to Donald Trump's ill-informed tweet." Khan, a human rights lawyer and practicing Muslim whose parents are from Pakistan, has repeatedly challenged Trump's calls to ban Muslims or people from majority-Muslim countries from entering the United States, saying the president has an "ignorant view of Islam." Trump, meanwhile, has said that "it is ignorant for him to say that" and has raised questions about London's approach to confronting terrorism. During the White House briefing on Monday, a reporter asked deputy press secretary Sarah Huckabee Sanders if the president went after Khan because he's Muslim. "Not at all," Sanders said, "and I think to suggest something like that is utterly ridiculous." The president's tweets come as London grapples with the aftermath of the attack and Khan tries to explain that the religious beliefs of the terrorists involved are not the same beliefs embraced by him and most of the world's 1.6 billion Muslims. "The action of these three men on Saturday night was cowardly, was evil," Khan said at a news conference Monday. "And I'm angry and furious that these three men are seeking to justify their actions by using the faith that I belong to. ... The ideology they follow is perverse, it is poisonous and it has no place in Islam. And I condemn this terrorist act but also the poisonous ideology these men and others follow." The president's decision to lash out at the London mayor was widely questioned, with several critics asking why Trump was picking a fight with Khan as his city attempts to recover from Saturday's attacks. Some noted that after a mass shooting at a gay nightclub in Orlando, Florida, in June 2016, Khan tweeted: "I stand with the City of Orlando against hate and bigotry. My thoughts are with all the victims of this horrific attack #lovewins." Trump's tweets were widely mocked in Britain, where the overwhelming mood is one of unity against terrorism and praise for security services. Jeremy Corbyn, leader of the opposition Labour Party, accused the president of lacking "grace" and "sense." British Prime Minister Theresa May, who has tried to foster a productive relationship with Trump, came to Khan's defense on Monday, telling journalists the mayor was "doing a good job, and it's wrong to say anything else." Lewis Lukens, the acting ambassador at the U.S. Embassy in London, tweeted on Sunday: "I commend the strong leadership of the @MayorofLondon as he leads the city forward after this heinous attack." Suhaib Webb - an imam who leads Center DC, which has a large online youth following - said he is angry the president and those close to him are "quick to pull the trigger on anything that has to do with Islam or involves a person of color." "I think it's also extremely embarrassing as Americans that our president is engaged in a Twitter war with the mayor of a city in a sovereign country," Webb said. "It's shameful that we've reinforced a bully personality. ... We have someone who is unhinged." Khan, a member of the Labour Party, took office in May 2016. Much of last year's mayoral race focused on Khan's religion and family background, and his then-rival Zac Goldsmith accused him of having "repeatedly legitimized those with extremist views." "What I think the election showed was that actually there is no clash of civilization between Islam and the West," Khan said in an interview with Time magazine. When asked about Islamist extremists, he said: "What better antidote to the hatred they spew than someone like me being in this position?" Soon after Khan became mayor, then-candidate Trump told the New York Times that he would make an exception to his proposed ban on foreign Muslims for Khan - an offer he turned down. "I think Donald Trump has ignorant views about Islam. It's not just about me. I don't want to be the exception to be allowed to go to America," Khan said in an interview on a British morning show in May 2016. "You can be a Muslim and you can be European." Trump wasted little time firing back. "He doesn't know me, never met me, doesn't know what I am all about," he said. "I think they are very rude statements. Frankly, tell him I will remember those statements."